Natural Homemade Cucumber Face Pack. There are many facemask that can be made easily at home with cucumber and a few kitchen ingredients. Here are a few easy to make cucumber home remedies for glowing skin. For oily acne prone skin, use this refreshing oil control cucumber and oatmeal facemask. Cucumber will refresh your skin and hydrate it, removing excess oil and dirt. The oatmeal will exfoliate your skin cells and slough off excess sebum and dead cells on the skin surface. Honey will smooth your skin and control the abrasive texture of the oatmeal to prevent over exfoliation. 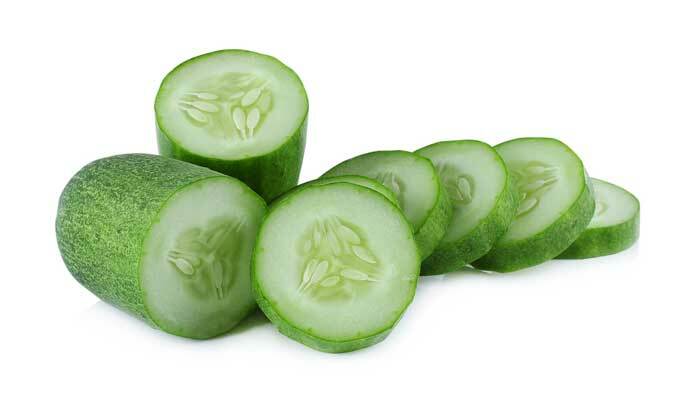 Cucumber is one of the best kitchen ingredient to soothe, heal, and water dry withered skin. Combined with Greek yogurt or simply thick plain yogurt, you can create an awesome facemask to nourish your dry skin and make it supple and smooth again. When combined with honey and coffee powder, cucumber acts as a natural skin-tightening agent. This face mask, with a regular use, can tighten your skin and give it a natural lift by reducing cellulite. Both cucumber and mint come with cooling properties that add extra freshness to your skin. The vitamins present in mint and the moisturizing properties of a cucumber can add a healthy glow to your complexion from within. This works best when used in the morning. Keeping your skin looking bright and fresh is important for looking and feeling great. Cucumber is a power packed food with numerous nutrients that nourish the skin and keeps its hydrated. Cucumber not only helps in removing Sun tan but keeps you looking young and healthy. Using the above beauty tips for face, cucumber face masks and scrubs will go a long way in not only slowing down the aging process but also save you thousands of Rupees on unwanted beauty products. But remember, along with the use of cucumber, maintain a healthy diet and exercise every day for fresh younger looking skin.